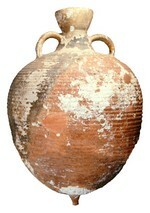 This is a globular amphora with a short conical neck, cupped, splayed or everted rim and two short bowed handles from the shoulder to the neck. However, this type was produced for some three hundred years and shows a development of form over that period (Opaiţ, 1996; 2004a: Figs. 7-10, 2004b; Karagiorgou, 2001; Sciallano & Sibella, 1991). At the beginning of the fourth century AD there is deep horizontal rilling on the shoulder and lower part of the body, while the central girth is decorated with broad rilling. There is a broad funnel-shaped mouth, longish body and small basal knob. At the end of the fourth / beginning of the fifth century, the form is shorter with a more squat body while the rilling is confined only to the shoulder area. By the middle of the sixth century the form is more oval in shape and the neck sharply conical. At this time the basal knob has shrunk to a basal wort. By the end of the sixth century the neck and rim are narrower with the rim sharply everted and the rilling appears wavy. However, it is clear that these variations, especially concerning the rim form, may not be strictly chronological but possibly regional (Swan, 2004). The type occurrs in contexts of the early fourth century AD in Scythia (Opaiţ, 1996; 2004a; 2004b) and at Athens (Robinson, 1959: Type M272). At Carthage there is a marked increase in its presence from about the mid sixth century, while production seems to have ended by the first half of the seventh century (Riley, 1981; Peacock, 1984a). It should be noted that Opaiţ (2004a; 2004b) believes that the antecedence of this form goes back to the first and second centuries AD. Production is attested on Chios and Cnidos (see Opaiţ, 2004a; 2004b) and at Kounoupi in the Argolid (Munn, 1985). Given the large volume of finds for this form other production areas are quite possible. A widespread distribution (Peacock & Williams, 1986), ranging from Britain (Thomas, 1981) to Tunisia (Riley, 1981; Peacock, 1984b], Cyrenaica (Riley, 1979), Athens (Robinson, 1959), Scythia (Opaiţ, 1996). The lower Danube (Karagiourgou, 2001; Swan, 2004), southern France (Bonifay & Villedieu, 1989) and at Tarragona (Keay, 1987).